Some people think that the best way to get the body they want is to divide and conquer; for example, one day they’ll do legs, the next day they’ll exercise their chest, the following day is for abs, and so forth. While this approach certainly has some benefits, there are also a lot of compelling arguments for a total-body workout, especially while incorporating HIIT-style Tabatas. There are a number of reasons why a full-body workout can be beneficial. Working your whole body can help to keep your muscles healthy and balanced, and utilizing multiple muscle groups at once has been shown to produce more testosterone and yield greater results than targeted movements. Because testosterone supports muscle development throughout the body, this is good news for men who want to bulk up. But men aren’t the only ones who can benefit from this sort of exercise. A total-body workout for women can have a lot of benefits too, if not even more so. Full-body resistance training has been shown to help women lose weight, fight aging, and maintain bone strength and density. Similarly, total-body exercises have been linked to reducing one’s risk of heart disease, colon cancer, breast cancer, diabetes, arthritis, digestive disorders, sleep problems, and a host of other health problems. If you’re looking for an intense way to get a full-body workout, it doesn’t get much better than Tabata. Tabata is a form of high-intensity interval training (HIIT), and it’s excellent for getting a great workout in a short amount of time. A Tabata workout combines 20-second periods of extreme effort with 10-second rest periods. In a typical Tabata workout, there are eight cycles, making a total of four minutes per exercise. Because it’s so intense, Tabata training is not recommended for people who are new to exercise or are out of shape. However, the intensity of a Tabata workout is what makes it so beneficial; but it can make it dangerous for people who aren’t physically prepared. Listen to your body, and be sure to warm up. Even the greatest workout won’t do you much good if you injure yourself. When you combine Tabata with full-body exercises, you reap the benefits of both exponentially. A full-body Tabata workout will push you to your limit in a relatively short amount of time, while helping you build a strong, lean, balanced body. It will increase your metabolism and allow you to burn fat for up to 24 hours after you work out. It will also increase your body’s ability to tolerate lactic acid, improve your cardiovascular and muscular endurance, improve your muscle mass, and decrease your level of body fat. When it was originally formulated, the Tabata workout was meant for use with stationary bikes. However, people have since adapted this exercise method for other exercises as well. While moving away from exercise bikes may remove some potential benefits in terms of the intensity of the exercise, it does allow for a Tabata to be more truly full-body. 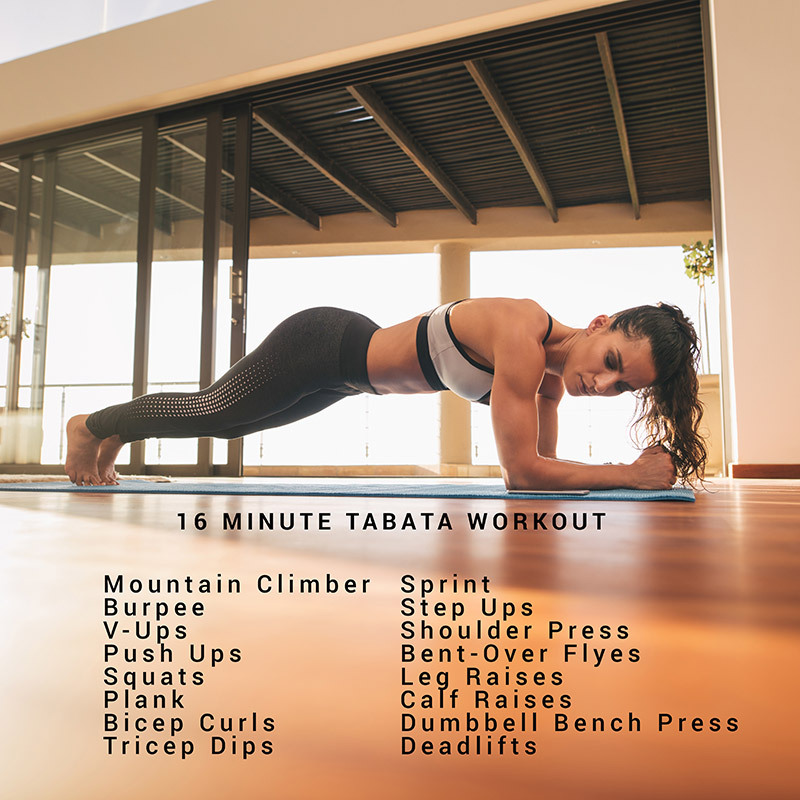 Try this total-body Tabata workout on for size, which will leave you totally exhausted, but thankfully only takes 16 minutes. Remember, perform the move for 20 seconds, then take a 10 second rest and continue to the next exercise. As always, remember to listen to your body and to be careful. Good form is more important than speed, and keeping your body healthy is the biggest goal of all. If your body isn’t ready for Tabata yet, work up to it.